July 22, 2016: The Sater and Cohen Deal Gets Handed Off To Millian and Papadopoulos? Last night on TV, Anthony Cormier said that the negotiations between Michael Cohen and Felix Sater actually continued into July, but that the later discussions were on encrypted chats that got deleted. Sater told POLITICO he was unaware he had exceeded the maximum contribution. Informed that purchases of campaign paraphernalia count as contributions, Sater said he had bought campaign merchandise in the basement of Trump Tower last month. He said he made two $2,700 contributions to the Trump campaign online through his iPad. The purchase of campaign merchandise and two contributions for $2,700 each are all dated July 21 in the FEC filing. That same day, George Papadopoulos signaled something to Ivan Timofeev about Trump’s RNC speech. The next day is almost certainly when Sergei Millian first started cultivating Papadopoulos. Millian’s cultivation of Papadopoulos likely explains this reference in the affidavit supporting Papadopoulos’ arrest, showing Papadopoulos asking Ivan Timofeev over Facebook on July 22, 2016 for any information he had on someone he was about to meet for the first time (see my timeline here). That would say that, on the same day WikiLeaks released the DNC emails — which itself took place a day after Papadopoulos signaled something about Trump’s RNC speech to Timofeev — Millian started cultivating Papadopoulos, who apparently had started spending more time in NYC. That relationship would lead to a proposed business deal between Millian and Papadopoulos — basically as cut-outs for the business deal that Cohen and Sater started. Mr. Trump’s improbable victory raised Mr. Papadopoulos’s hopes that he might ascend to a top White House job. The election win also prompted a business proposal from Sergei Millian, a naturalized American citizen born in Belarus. After he had contacted Mr. Papadopoulos out of the blue over LinkedIn during the summer of 2016, the two met repeatedly in Manhattan. One billionaire, he said, wanted to explore the idea of opening a Trump-branded hotel in Moscow. “I know the president will distance himself from business, but his children might be interested,” he wrote. Apparently, a new witness recently went to the FBI to describe Papadopoulos’ continued involvement in this deal — and his direct ties to Trump. 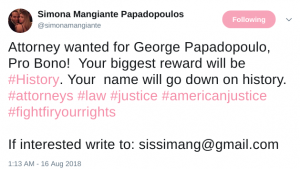 The letter, dated November 19 and obtained last week by The Atlantic, was sent to Democratic Representative Adam Schiff’s office by an individual who claims to have been close to Papadopoulos in late 2016 and early 2017. The letter was brought to the attention of Schiff and House Intelligence Committee staff, according to an aide who requested anonymity to discuss an ongoing investigation. The letter was also obtained by federal authorities, who are taking its claims “very seriously,” said two U.S. officials who also requested anonymity because of the sensitivities of the probe. The statement makes a series of explosive but uncorroborated claims about Papadopoulos’s alleged coordination with Russians in the weeks following Trump’s election in November 2016, including that Papadopoulos said he was “doing a business deal with Russians which would result in large financial gains for himself and Mr. Trump.” The confidant—whose name The Atlantic is withholding on request but whose identity is known to congressional and federal investigators—stated a willingness to take a polygraph test “to prove that I am being truthful” and had come forward now after seeing Papadopoulos “become increasingly hostile towards those who are investigating him and his associates.” A lawyer for Papadopoulos declined to comment. The confidant who sent the letter to Schiff’s office last week claimed to have witnessed a phone call between Papadopoulos and Trump in December 2016, around the same time that Papadopoulos was allegedly boasting about the Russia deal and sending emails to Flynn and Trump’s campaign CEO, Steve Bannon. In one email, Flynn urged Papadopoulos to “stay in touch, and, at some point, we should get together.” Trump has called Papadopoulos “a coffee boy” who played no meaningful role on the campaign. In his sentencing memorandum, Papadopoulos alluded to his concern about getting the job he expected in the Trump Administration (on which the deal with Millian was premised) to explain why he lied to the FBI in January 2017. The agents asked George to accompany them to their office to answer a “couple questions” regarding “a guy in New York that you might know[,] [t]hat has recently been in the news.” George thought the agents wanted to ask him about Russian businessman Sergei Millian. Wanting clarification, he asked the agents, “…just so I understand, I’m going there to answer questions about this person who I think you’re talking about.” The agents assured George that the topic of discussion was Mr. Millian who had been trending in the national media. George knew Mr. Millian only as a businessman pitching an opportunity to George in his personal capacity. The agents asked how they first met, what they discussed, how often they talked or met in person, if George knew whether Mr. Millian was connected to Russia or a foreign intelligence service, and who else on Mr. Trump’s campaign may have been in contact with Mr. Millian. George found himself personally conflicted during the interrogation as he felt obligated to assist the FBI but also wanted to distance himself and his work on the Trump campaign from that investigation. Attempting to reconcile these competing interests, George provided information he thought was important to the investigation while, at the same time, misleading the agents about the timing, nature, and extent Case 1:17-cr-00182-RDM Document 45 Filed 08/31/18 Page 9 of 16 10 of his contacts with Professor Mifsud, Olga, and Ivan Timofeev. In his answers, George falsely distanced his interactions with these players from his campaign work. At one point, George told the agents that he did not want to “get too in-depth” because he did not know what it would mean for his professional future. Out of loyalty to the new president and his desire to be part of the administration, he hoisted himself upon his own petard. All of that suggests the deal was still on in January 2017, and Papadopoulos was trying to preserve his opportunity to serve as a cut-out for the deal and so lied to the FBI. Mind you, it may be that the deal was not entirely handed off. Glenn Simpson told HPSCI that Fusion had substantiated ties between Millian and Cohen (though I hope he looked further than Twitter). And then, you know, as further time went on, we found he was connected to Michael Cohen, the President’s lawyer. 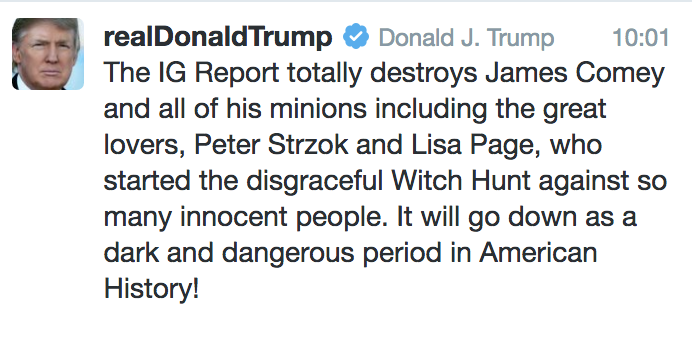 And eventually, after boasting about a lot of this stuff on camera, on tape, to the TV network, he backed away from all of it suddenly when the Russia controversy began to get hot. And Michael Cohen was very adamant that he didn’t actually have a connection to Sergi, even though he was one of only like 100 people who followed Sergi on Twitter. And they — we had Twitter messages back and forth between the two of them just – we just pulled them off of Twitter. In a blockbuster follow-up to their May report that laid out all this Trump Tower stuff, Buzzfeed hints at other people Cohen was in contact with, who also were involved in the hack and leak operation. Which of course would make it unsurprising if July 22, the same day WikiLeaks released the DNC emails, was the day the real estate deal backing it up would get handed off to further obscure it. Update: In this really report on Cohen’s plea, Rudy sounds like he’s not sure whether the deal went forward or not. https://www.emptywheel.net/wp-content/uploads/2018/04/Screen-Shot-2018-04-15-at-2.41.39-PM.png 296 447 emptywheel https://www.emptywheel.net/wp-content/uploads/2016/07/Logo-Web.png emptywheel2018-11-30 11:02:552018-12-02 11:30:37July 22, 2016: The Sater and Cohen Deal Gets Handed Off To Millian and Papadopoulos? In this post, I argued that George Papadopoulos’ sentencing memo was written to make a case to Donald Trump for a pardon, not to judge Randolph Moss for no prison time (even though that’s what he asks for). It would follow logically, then, that the details of his testimony Papapdopoulos chose to highlight in a claim that “George provided investigators with critical information” — details that have attracted much of the press coverage of this memo — also aren’t intended for our benefit, but for Trump and other co-conspirators. On March 31, 2016, he joined Mr. Trump, Senator Jeff Sessions, and other campaign officials for a “National Security Meeting” at the Trump Hotel. George’s photograph at this meeting flashed around the world via Twitter. Eager to show his value to the campaign, George announced at the meeting that he had connections that could facilitate a foreign policy meeting between Mr. Trump and Russian President Vladimir Putin. While some in the room rebuffed George’s offer, Mr. Trump nodded with approval and deferred to Mr. Sessions who appeared to like the idea and stated that the campaign should look into it. At a minimum, after 11 months of being prevented from sharing this detail, including it here tells all the other co-conspirators what Papadopoulos said. The allegation is not new; at least two other participants in the meeting offered a similar version to Reuters in March (and presumably to the FBI before that). Still, Papadopoulos provides the detail in such a way and at such a time that it’s sure to generate pressure on Sessions, just as Trump is trying to convince Republican members of Congress he should fire the Attorney General. Not to mention that Papadopoulos raises an example of a person who has thus far avoided all consequences for lying in official settings. An even more delicious mention is the specific description Papadopoulos gives of the meeting at which Joseph Mifsud told him the Russians had Hillary emails they planned to release to help Trump. George strived to organize a meeting with the Russian government and help the Trump campaign promote its foreign policy objective: improve U.S. and Russian relations. He believed that such a meeting would be a boon for the campaign as Mr. Trump had not yet hosted any major foreign policy events with officials from other countries. Papadopoulos’ statement of the offense had made it clear that Mifsud mentioned the emails in the context of Papadopoulos’ efforts to set up a meeting. On or about April 25, 2016, defendant PAPADOPOULOS emailed [Stephen Miller — see this story confirming Miller as the “Senior Policy Advisor” in the document]: “The Russian government has an open invitation by Putin for Mr. Trump to meet him when he is ready . The advantage of being in London is that these governments tends to speak more openly in “neutral” cities. The Schiff memo and Alexander Downer have subsequently added the detail that Mifsud specifically told Papadopoulos that, “the Russians might use material that they have on Hillary Clinton in the lead-up to the election, which may be damaging,” to assist Trump’s campaign. Obviously, the tie between Russia releasing stolen emails and foreign policy meetings was always implicit. But Papadopoulos has just revealed that Mifsud said Russia might release emails in the context of setting up a meeting, after having floated such a meeting with Miller the day before. The breakfast meeting ties the release of the stolen emails to help the Trump campaign and foreign policy meetings together directly. 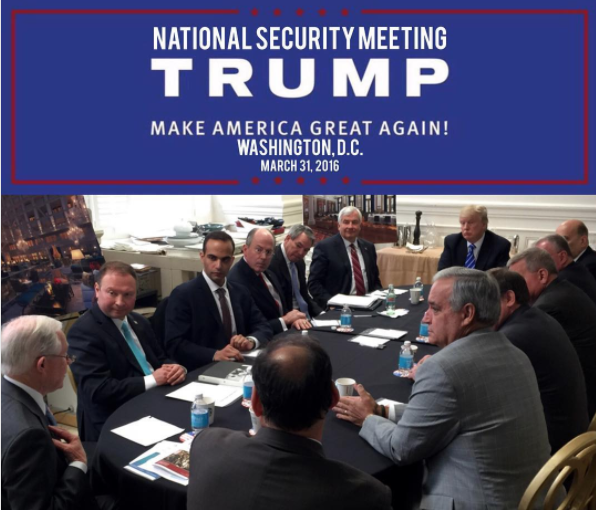 And having just sat through such a meeting, Papadopoulos worked with Stephen Miller and Corey Lewandowski to send a message to Russian that Trump was willing to meet — and would pursue improved relations with Russia. I’m most interested, however, in the inclusion of Papadopoulos’ admission he told the Greek Foreign Minister about the Russian offer of dirt just before Putin came to town on May 27, 2016. George provided investigators with critical information. George told investigators about his interactions and meetings with other members of the campaign. He detailed a meeting in late May 2016 where he revealed to the Greek Foreign Minister that the Russians had “dirt” on Hillary Clinton. He explained that this meeting took place days before President Vladimir Putin traveled to Greece to meet with Greek officials. Remember, Natalia Veselnitskaya dates the idea for the June 9 meeting to a conversation she had with Aras Agalarov at “the end of May” 2016. But it’s not just the tantalizing possibility that Papadopoulos left some kind of message for Putin just before Aras Agalarov started setting up the June 9 meeting. Papadopoulos’ statement of the offense describes him emailing Paul Manafort about Russia’s desire to set up a meeting, which Manafort forwarded to the government’s most important now cooperating witness, Rick Gates, telling him that the candidate wasn’t going to do such meetings himself — someone else in the campaign would. The House Intelligence Majority Report, however, reveals that that Papadopolous sent that email from Greece. While it’s clear nothing in that email could have reflected a discussion of passing a message to Putin via Papadopoulos’ Greek contacts, it does show that Papadopoulos used the opportunity of a verbal offer from Greece to raise a Russian meeting with Manafort directly. Manafort responded by saying other campaign aides would do such meetings. Papadopoulos then somehow saw reason to tell Greece’s Foreign Minister that the Russians were offering dirt to help Trump just before Putin arrived. And that’s precisely the timeframe when the June 9 meeting setting up a Russian meeting with Trump’s senior-most campaign officials, including Manafort, got born. Maybe it’s all a big fat coinkydink, but Papadopoulos seems to believe it important enough to tell all his co-conspirators (even while it makes his repeated claims not to have told the campaign itself laughable), possibly because he knows the FBI has evidence from the Greeks as well. CNN provides an explanation, such as one is possible, for why Trump thinks the DOJ IG report on the Hillary investigation undermines the entire Russia investigation, which he just tweeted about. The logic treats the FBI investigation into suspected Russian assets on Trump’s campaign as a conspiracy against Trump personally, based in part on Peter Strzok’s texts, taken out of the context of decisions made on the Russia investigation. Trump’s lawyers now believe that since the IG report gave those at the FBI “the benefit of the doubt” about their behavior — finding no conspiracy — then the President should receive the same treatment. “Why doesn’t that apply to the President as well?” one source said. Of course, even within the context of the Hillary IG report, Strzok offers the evidence against the corruption of the FBI: that unlike the constant leaks about the Hillary investigation (the IG Report’s far biggest fault is that it doesn’t treat the leaking from SDNY as a topic unto itself), the FBI didn’t leak, at all, about the investigation into the suspected Russian assets on Trump’s campaign. Because this is an IG Report on the Hillary investigation and not an IG Report on the Russia investigation, it does not explain the import of this answer from Strzok, explaining his insurance policy text. Strzok provided a lengthy explanation for this text message. In substance, Strzok told us that he did not remember the specific conversation, but that it likely was part of a discussion about how to handle a variety of allegations of “collusion between members of the Trump campaign and the government of Russia.” As part of this discussion, the team debated how aggressive to be and whether to use overt investigative methods. Given that Clinton was the “prohibitive favorite” to win, Strzok said the reference in his text message to an “insurance policy” reflected his conclusion that the FBI should investigate the allegations thoroughly right away, as if Trump were going to win. Strzok stated that Clinton’s position in the polls did not ultimately impact the investigative decisions that were made in the Russia matter. In the inevitable IG report on the Russia investigation, this passage will be followed with analysis of what the outcome of this debate was, whether to use overt investigative methods or not. It will show that Strzok lost that debate. We know that, in part, because Sally Yates said as much, and said it about the investigation into Paul Manafort. This is her explanation to the IG about overt steps in advance of an election. And the Bureau never pushed back on that concept. This actually came up with, in the connection with Paul Manafort. And they had an investigation on Manafort and I had a lengthy discussion with [McCabe], at least one, maybe more, about how important it was at that time that our investigation not be overt. And what they were, what the Bureau was doing with respect to Manafort because that could impact Trump even though he was no longer his campaign manager. That unless there was something they really needed to do, because they were getting records and doing that kind of, unless there was something they needed, really needed to do overt they really needed to stay under the radar screen…. Because it’s not fair to impact [an election]. That this comment is about Manafort is significant for two reasons. First, because Manafort’s corruption was — like the Hillary email investigation — public. More importantly, the date of Strzok’s text, August 15, likely means the discussion was specifically in the contexts of the stories that week about Manafort’s corruption. Moreover, there’s additional evidence the FBI didn’t take overt steps, particularly with those still tied to Trump’s campaign. 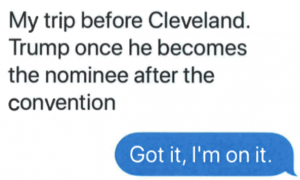 It wasn’t until some time after February 16, 2017 — literally six months after that text — that FBI subpoenaed George Papadopoulos’ call records, a move FBI could have taken at any time with a “relevance” standard. That delay meant that Papadopoulos hid the existence of his entire communication history with Ivan Timofeev until after his two interviews (and tried to hide it entirely by deleting his Facebook account). In this post, I showed that, given that they didn’t know about Ivan Timofeev until after his interviews, they could not even have started pursuing a warrant until after the first interview, at best (and didn’t know about the existence communications over a Section 702 provider with Timofeev until after both). In this post, I suggested that it looked like the FBI first obtained a preservation order for the device GSA had on him on March 9, 21 days after his second interview. Since then two details have come out. 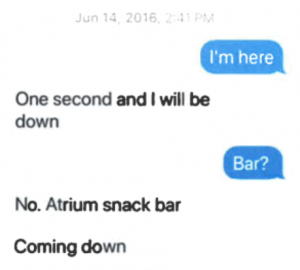 First, this Peter Strzok/Lisa Page SMS text highlighted by Matt Tait suggests that as late as June 6, 2017, the Special Counsel’s office was still debating whether searching Section 702 presented a litigation risk (meaning Trump’s buddies are getting far more protection than the rest of us might be). Then there’s a point that Eric Swalwell made in Monday’s hearing debating whether or not to reveal the Schiff memo. 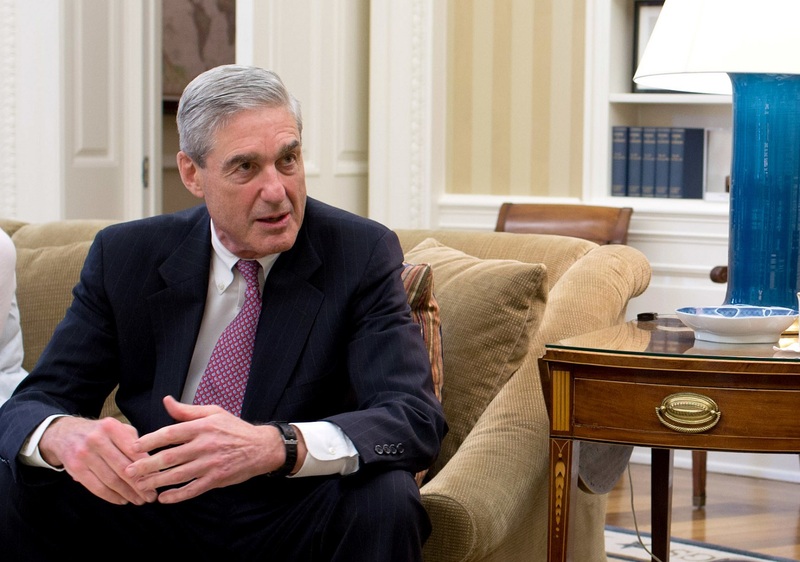 In response to Michael Turner’s suggestion that there was no evidence of “collusion” between Trump and Russia, Swalwell pointed out that only after the FBI challenged Trump aide claims did the Bureau find evidence to support a conspiracy. 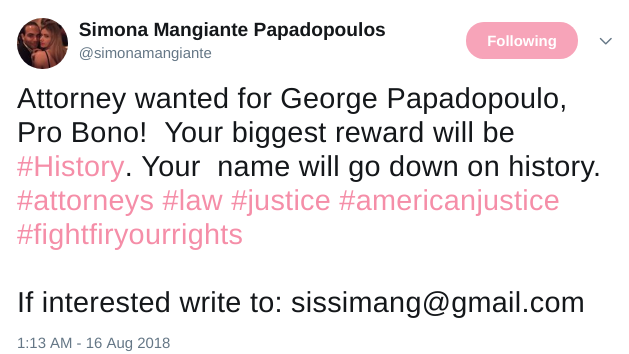 George Papadopoulos I think is the canary in the coal mine. He was interviewed January 27, 2017, by FBI. He lied about his contacts over in London with the professor. He was interviewed again in February, and he lied. Only when the FBI showed the willingness to subpoena his Skype and Facebook logs did he come around 6 months later. This makes it clear that the FBI had not even obtained call records from Papadopoulos (via an NSL or a subpoena) before the second interview, the standard for which is really low. Again, this shows that, at least during that phase of the investigation, the FBI was moving very conservatively. And, as noted, even several weeks after Robert Mueller took over the investigation, the team was still debating whether they could do what FBI otherwise does at an assessment level, which is to search 702 data in the FBI’s custody. As I’ve noted, the use of lifetime Republican Stefan Halper to ask Papadopoulos questions (the FBI can use informants at the assessment level) rather than collecting actual call records not only seems to have been an effort to use least intrusive means possible to chase down leads, but it also badly delayed the discovery of key details about Russia’s attempts to curry favor with Trump aides. If Peter Strzok argued in August that the FBI should be far more aggressive investigating suspected assets infiltrating the Trump campaign to prevent the possibility that a Manchurian candidate might take over the country, he lost that debate, and continued to lose it for the almost the entirety of the time he was involved in the investigation, which according to the IG Report came on July 28, the day after IG Michael Horowitz informed Rod Rosenstein and Mueller about his texts with Lisa Page. 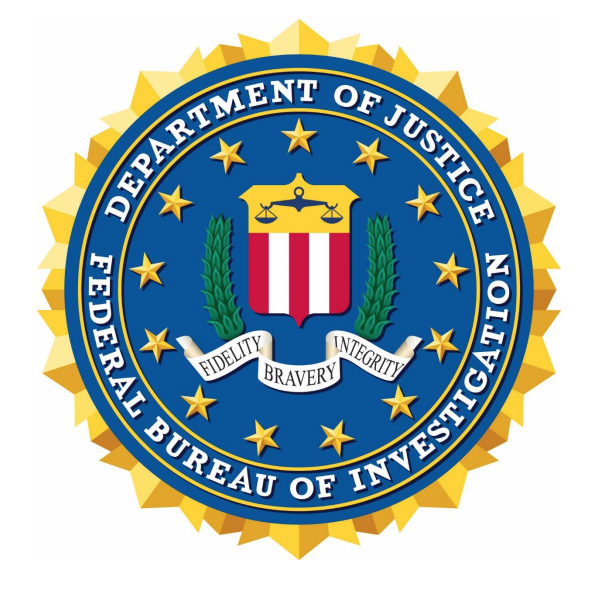 We then obtained all text messages and instant messages for those FBI personnel for the entire period of the Midyear investigation through July 1, 2017, to capture post-election discussions. Strzok was removed from the Special Counsel’s investigation on approximately July 28, 2017, and returned to the FBI in another position, after the OIG informed the DAG and Special Counsel of the text messages discussed in this report on July 27, 2017. So Strzok lost his argument to investigate more aggressively, and as soon as evidence of his alarm about the suspected assets infiltrating the Trump campaign and his disgust with Trump generally became known, he was removed from the case. This is the evidence that Trump wants to turn into a conspiracy against him. Here’s his explanation of the text after the fact, which would incorporate information he learned in the two months he remained on the investigation after May 18. On May 18, he suggested there was no big there there. 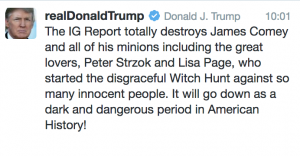 But in a description of the investigation that reflects knowledge through July 28, during which period FBI finally started analyzing call records (and also learned about the June 9 Trump Tower meeting), he instead weighed it as a matter of determining whether there was a “broad, coordinated effort” or just “a bunch of opportunists seeking to advance their own or individual agendas.” Virtually all the evidence answering that question was collected and analyzed after Peter Strzok was removed from the investigation. One detail here is new, however. When describing his understanding of the investigation through July 28, Strzok described Russians offering emails to members, plural, of the Trump campaign. Not just Papadopoulos. Update: This post was edited for flow. The frothy right has grabbed ahold of this Chuck Ross story, thinking it helps their case, without realizing that the main finding in it actually confirms something Adam Schiff noted in February (which Ross struggled to understand at the time). So I’d like to point out what Papadpoulos said when. Per Ross’ quotes from Alexander Downer’s April 28 interview, here’s what Papadopoulos told Downer on May 10, 2016. “During that conversation, [Papadopoulos] mentioned the Russians might use material that they have on Hillary Clinton in the lead-up to the election, which may be damaging,” Downer told The Australian. That’s mostly consistent with a redacted passage of the Schiff memo, which as I noted at the time must say something to the effect of Russia said it had materials that that it would release to help Trump, though given the public record I suspect there’s a dispute about whether hurting Hillary in a two-person race amounts to helping Trump. George Papadopoulos revealed [redacted] that individuals linked to Russia, who took interest in Papadopoulos as a Trump campaign foreign policy adviser, informed him in late April 2016 that Russia [two lines redacted]. Papadopoulos’s disclosure, moreover, occurred against the backdrop of Russia’s aggressive covert campaign to influence our elections, which the FBI was already monitoring. That Papadopoulos had not told Downer in May they were emails was made clear by the next line in the Schiff memo, which made it clear HPSCI (but not the US government) only learned Russians had said the damaging material was email (which, if Papadopoulos can be trusted, he took to be the 30,000 emails that Hillary deleted, which the Russians would only have had if they had previously hacked her) when Papadopoulos’ plea was released. We would later learn in Papadopoulos’s plea that the information the Russians could assist by anonymously releasing were thousands of Hillary Clinton emails. In any case, Downer’s public statements, as summarized by Ross, confirm what Schiff claimed back in February: Papadopoulos told a virtual stranger in May 2016 that someone had recently approached him, a newly-minuted Trump advisor, and told him Russia had damaging material on Hillary that they were thinking of releasing closer to the election. Downer makes it clear he reported the Papadopoulos within 48 hours because it “seemed quite interesting” and “was worth reporting.” The Australians didn’t tell the US, however, until July, after the DNC release made it look like Papadopoulos had predicted that event several months earlier. In response, the FBI opened a CI investigation, and Peter Strzok got on a plane and interviewed Downer. It’s possible he checked in with Stefan Halper, who had been chatting up Carter Page, about whom the FBI had had enough concern to interview him back in March, for a few weeks. It’s also possible Strzok asked the Brits what they knew about Joseph Mifsud (or it’s possible NSA started targeting Mifsud and captured his communications with the Russians). It’s also possible that the anonymous “Trump campaign policy adviser [who] testified [to SJC] that Mr. Papadopoulos informed him that he had information on Hillary Clinton from the Russians,” went to the FBI in the wake of the DNC release, so before the FBI (presumably) asked Halper to ask Papadopoulos more questions. Whatever happened, in September, Halper met with Sam Clovis and from that basically created a reason to invite Papadopoulos to London to do research. In mid-September, after his assistant Azra Turk had already broached the subject (I’m not aware that Ross has ever revealed how Papadopoulos responded to her) Halper asked Papadopoulos whether he was involved in the release of the emails. According to one version among several, Ross reports that Papadopoulos said that “hacking” the emails would be treason. Sources familiar with Papadopoulos’ version of events say that during one conversation, Halper asked Papadopoulos whether he was involved in the release of DNC emails. Papadopoulos denied it, telling Halper that hacking emails would be treason. Of course, that answer is nonsensical. Hacking emails is a CFAA violation, among other things. Absent knowing cooperation with Russian spies, it’s not treason. Moreover, as Ross depicts the question, Halper asked if he “was involved in the release of DNC emails,” which is different than hacking them. Did Papadopoulos instead suggest that being “involved in the release of DNC emails” hacked by Russia would be treason? It’s a good question because, in spite of that answer and his subsequent lies to FBI, Papadopoulos doesn’t believe he “colluded” with Russia because he, “did not see, handle or disseminate Clinton emails, according to the source with information on the Downer meeting.” Note, he’s pointedly not denying that he told the campaign about the damaging material in the context of efforts to set up increasingly senior-level meetings with the Russians. When the FBI interviewed Papadopoulos on January 27, 2017, he provided a detail he hadn’t to Downer (but which FBI may have already confirmed elsewhere): that Mifsud had specified, even before the Democrats knew about it, that the Russians had thousands of emails. Now, at least according to the public record, up until this point (and even later), the FBI hadn’t done one of the most basic things they do in investigations, which they can do on a relevance standard (meaning the person in question need not be suspected of any wrong-doing). They had not yet obtained Papadopoulos’ call records, nor had they searched already collected Section 702 data to see if Papadopoulos had had communications with any foreigner already under a full FBI investigation. The latter would have definitely alerted the FBI to something that Papadopoulos hid in his interviews with the FBI (and tried to hide by deleting his Facebook account, something Ross always leaves out of his efforts to spin Papadopoulos’ honesty): in addition to Mifsud and the fake Putin niece, he had been communicating with (and passing communications onto the campaign) Ivan Timofeev, someone Papadopoulos believed to be employed by the Russian government. DOJ’s public Papadopoulos documents are curiously silent about whether he admitted that Mifsud had told him the Russians planned on releasing the emails to hurt Hillary (though I guarantee you his case file makes it clear). Amid the squeals of surveillance, that point is worth noting. Again, at least according to the public record, it was some time after Papadopoulos had told Downer that the Russians had damaging material they might release closer to the election to hurt Hillary and after Papadopoulos had told the FBI that the damaging material in question was “thousands of emails” before the FBI took one of the most basic investigative steps, figuring out whom Papadopoulos had been talking to during that period. Though FBI put a preservation order on his campaign cell phone in March, it’s even possible, given Papadopoulos’ arrest in the wake of the disclosure of the June 9 meeting earlier in July 2017, that FBI didn’t take that step until after the later Russian offer of dirt on Hillary became known. Trump may well think this amounts to spying. But given the year of concern about Russian meddling, it looks even more like an effort to bend over backwards to avoid touching materials that might impact campaign issues. Update: Thanks to Mark S for this link to the Downer piece. Ross did not include this stronger language that the material definitely would be damaging to Clinton. Note the bolded stronger language. Of the conversation at the upmarket Kensington Wine Bar, Downer recalls: “We had a drink and he (Papadopoulos) talked about what Trump’s foreign policy would be like if Trump won the election. Did you realise you were one of the first people to have known about this dirt? Sources familiar with Papadopoulos’s version of their meetings said Halper randomly asked Papadopoulos whether he knew about Democratic National Committee emails that had been hacked and leaked by Russians. During one of their dinners, Halper asked Papadopoulos whether he was involved in the Russian theft of Democrats’ emails, sources familiar with Papadopoulos’ account have told TheDCNF. Papadopoulos denied the allegation, saying that stealing emails would be treason. Halper grew frustrated, according to sources. This is the first story in this series where Ross describes what Papadopoulos pled guilty to, but he gets it wrong in a key way I’ll describe below. 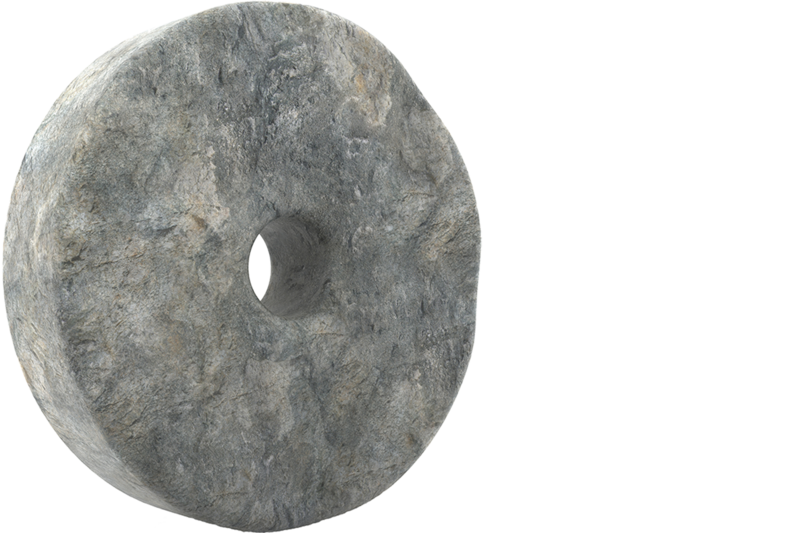 Finally, Ross offers yet another description in a new story today. Sources familiar with Papadopoulos’ version of events say that during one conversation, Halper asked Papadopoulos whether he was involved in the release of DNC emails. Papadopoulos denied it, telling Halper that hacking emails would be treason. Halper grew frustrated, according to the sources. Today’s story claims we don’t know what Alexander Downer told FBI. We do know one detail he omitted: That Downer told the FBI that Papadopoulos told him Mifsud said the Russians were going to release the emails to help Trump. Now, as I said, in yesterday’s story, Ross described the substance of the lies Papadopoulos told the FBI slightly wrong. Papadopoulos has pleaded guilty to lying to the FBI about the timing of his encounters with Mifsud and two Russian nationals. He did, however, tell the FBI in his initial interviews that Mifsud mentioned Clinton documents. Ross leans on his misunderstanding of Papadopoulos’ guilty plea to argue today that FBI should have interviewed Papadopoulos back in August, rather than ask a lifelong Republican to ask the same questions while hiding the FBI interest. And sources familiar with Papadopoulos’s version of the FBI interview say he claims that he, and not the FBI agents, first mentioned Mifsud during the interview, which was conducted in Chicago without lawyers present. That is, Ross argues that because Papadopoulos offered up that he met a weird guy named Mifsud who told him the Russians were offering dirt in the form of Hillary emails, he could be trusted to have been honest had the FBI asked him in August. As I said, though, Ross’ first description of Papadopoulos’ guilty plea is wrong in several ways. Ross hides how important Papadopoulos said Mifsud seemed; the FBI describes Papadopoulos claiming Mifsud was just BSing. The former Trump aide similarly denied having any relationship with the Russian woman Mifsud introduced him to. Both those details make Papadopoulos’ lies about the timing more important: he lied about how important he believed these two were and he lied about the way their outreach to him tied to his role on the campaign. In Ross’ first description of his plea, however, he suggested that Papadopoulos affirmatively lied “about the timing of his encounters with Mifsud and two Russian nationals,” the second of whom we know to be Ivan Timofeev. That’s wrong. In the first interview, Papadopoulos (successfully) hid the entire existence of Timofeev. That’s key because Papadopoulos was forwarding communications from Timofeev, a Russian official, talking about setting up meetings with campaign officials. He was forwarding these emails to the campaign in the weeks leading up to the June 9 meeting. Indeed, Papadopoulos told Timofeev that Trump’s first campaign speech was a sign that the candidate was willing to meet. By hiding Timofeev, Papadopoulos was hiding high level campaign knowledge of the outreach (including Paul Manafort). Ross fails to mention another damning thing the purportedly forthcoming Papadopoulos did the day after his second FBI interview: delete his Facebook account, and with it his communications with Timofeev, and get a new cell phone, presumably destroying secure communications. There is no way Papadopoulos would have been any more honest with FBI in August 2016 than he was in January. And if the third and fourth version of Ross’ description of the Halper-Papadopoulos exchange is any indication, then it’s very clear why Papadopoulos would have always lied about the communications: because he considered the very same kind of back and forth with Russians tied to the email release treason. Papadopoulos was trying to cover up evidence he thought might prove treason. 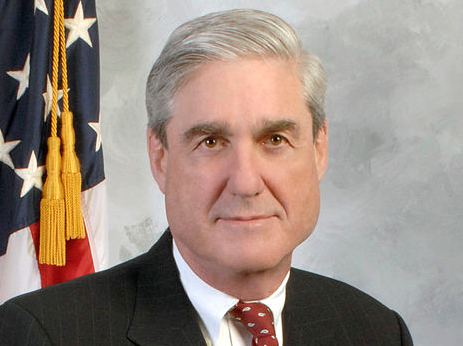 I wasn’t going to do this originally, but upon learning that the Mueller questions, as NYT has presented them, don’t maintain the sixteen subjects or even the 49 questions that Jay Sekulow drew up from those 16 areas of interest, and especially after WaPo continues to claim that Mueller is only investigating “whether Trump obstructed justice and sought to thwart a criminal probe into Russia’s interference in the 2016 presidential election,” I am going to do my own version of the questions, as released by the NYT. I’m not pretending that this better represents what Mueller has communicated to Sekulow, nor am I suggesting NYT’s version isn’t valid. But the questions provide an opportunity to lay out a cultivation, quid pro quo, and cover-up structure I’ve been using to frame the investigation in my own mind. This post lays out the “cultivation” questions Mueller wants to pose. The questions start well before the election, focusing on both Trump’s persistent interest in building a Trump Tower in Moscow, the cultivation of Trump by the Agalarov camp, and Trump’s interest in becoming best friends with Vladimir Putin. The questions may also include other real estate deals that would be less obviously tied to Russia, but possibly just as compromising. It’s worth remembering, Trump probably didn’t expect he’d win. So the Trump Tower offers were a prize that would be available (and easier to take advantage of) based on the assumption he’d lose. On November 9, 2013, the Agalorovs helped Trump put on Miss Universe in Moscow; Trump Tower meeting attendees Rob Goldstone and Ike Kaveladze were both also involved. If the pee tape — or any kompromat involving “golden showers,” as Jim Comey claims Trump called it — exists, it was made on November 8, 2013. Leading up to the event, Trump talked about meeting Putin and “will he become my new best friend?,” but that reportedly did not happen. But he did meet a bunch of other oligarchs. 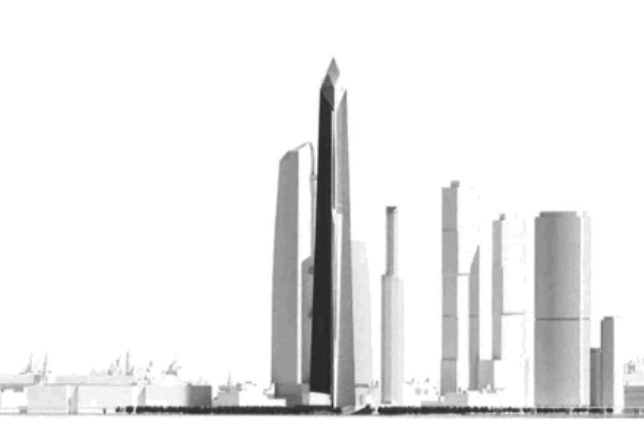 In the aftermath of the event, the Agalorovs floated building a Trump Tower in one of their developments. 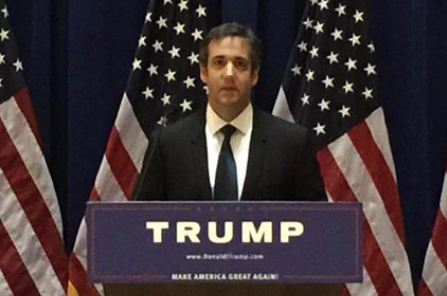 November 2, 2015 to November, 2016: What communication did you have with Michael D. Cohen, Felix Sater and others, including foreign nationals, about Russian real estate developments during the campaign? On November 3, 2015, at a time when Trump’s campaign was experiencing remarkable success, and well after (per the Internet Research Agency indictment) the election year operation had started, Felix Sater approached Michael Cohen to pitch yet another Trump Tower in Moscow deal. 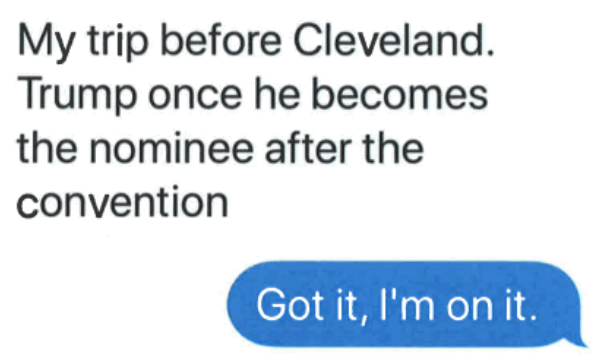 He tied the deal explicitly to getting Trump elected. Remember: Mueller’s subpoena to Sam Nunberg goes back to November 1, 2015, suggesting this is the timeframe he’s thinking explicitly about. The initial public story about the deal — which Cohen tried to squelch before his congressional interviews — claimed that the deal fizzled out in January 2016. More recent reporting has revealed that one of the people involved in this deal has ties to GRU, the Russian intelligence organization behind the hack-and-leak, and that Cohen pursued it at least as late as June, 2016. 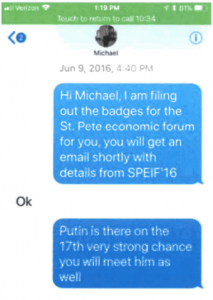 Around that time (possibly on July 22, with the involvement of Ivan Timofeev, who was involved in offering up emails), Sergei Millian — who had brokered Trump business with Russians in the past — started cultivating George Papadopoulos. After the election, Millian pitched that the two of them should do a Trump Tower deal. The Trump Tower offers are only the most obvious election-related deal Mueller might be interested in. In October 2016, for example, Cypriot businessman Orestes Fintiklis obtained a majority stake in the troubled Trump Panama development, which he has since taken over (possibly along with a bunch of papers showing the money laundering Ivanka did to fill the building). And all that’s before you consider any deals Jared was pitching. The other day, the WaPo had a story reviewing the larger role in the Trump campaign George Papadopoulos had than the Trump folks admit. Much of this work has appeared elsewhere, but I’m particularly interested in the WaPo’s account of the direction Deputy Comms Director Brian Lanza gave to George Papadopoulos regarding an Interfax interview he would do. He emphasized that the campaign wanted the message that it wanted a partnership with Russia on Syria. As WaPo notes, the resulting interview is one Papadopoulos made sure Ivan Timofeev saw, in what may be part of a signaling process to Russia on Trump policy questions. In it, Papadopoulos specifically came out against regime change, one of the US policies Putin especially loathes. Q.: Do you share the opinion that the Assad regime should be immediately removed from power in Syria? A.: We do not support aggressive changes of regimes anywhere including Syria. Look what had happened in Lybia and Iraq. We all remember this. However, it does not mean that we support Assad either. Syria was key in other signaling — and in Jared’s top policy priorities immediately after the election. The focus on Syria is key: remember that Jared Kushner explained his request to Sergei Kislyak for a Russian-run secure back challenge as an effort to cooperate on Syria. The Ambassador expressed similar sentiments about relations, and then said he especially wanted to address U.S. policy in Syria, and that he wanted to convey information from what he called his “generals.” He said he wanted to provide information that would help inform the new administration. He said the generals could not easily come to the U.S. to convey this information and he asked if there was a secure line in the transition office to conduct a conversation. General Flynn or I explained that there were no such lines. I believed developing a thoughtful approach on Syria was a very high priority given the ongoing humanitarian crisis, and I asked if they had an existing communications channel at his embassy we could use where they would be comfortable transmitting the information they wanted to relay to General Flynn. So it’s possible the attacks on Hillary’s Syria policy were a signal — as the earlier speech’s call for engagement with Russia apparently was — to Timofeev. The Papadopoulos interview was published on September 30, just 11 days before Don Jr. flew to Paris to meet with some pro-Russian Syrians. One meeting that Donald Trump Jr. has not fully explained is a speech in Paris on October 11, 2016, just weeks before the election. In his capacity as a key member of the Trump campaign, Trump Jr. spoke at the meeting at the request of a French think tank, The Center of Political and Foreign Affairs. 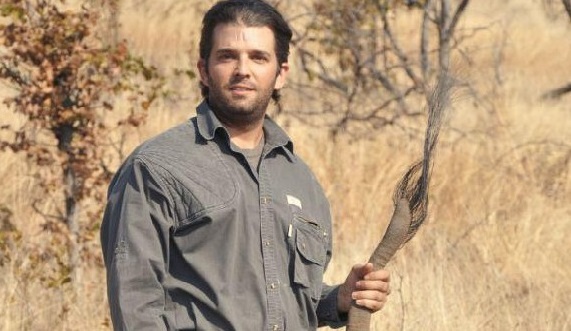 Trump Jr. was likely paid about $50,000 for the speech, according to the speaking fees listed by talent booking agency that represents him. The CFPR has a reputation in the French press as being “openly connected to the Russians.” It is difficult, however, to track just how connected they are, as France does not require it’s nonprofit organizations to disclose their finances. The founders of the center have worked closely with the Russian government to end the conflict in Syria and in 2016, nominated Russian President Vladimir for the Nobel Peace Prize. The center’s director, Fabien Baussart, has been described as “a former lobbyist for Russian oligarchs in France.” He cited Putin’s “peace-making efforts” as reason for his nomination. One of the founders, Baussart’s wife Randa Kassis, heads a political party called the Movement for a Pluralistic Society, which is in part endorsed by Russia in support of Syrian president Bashar al-Asssad. Now we know, then, that even at the level of flacks, the emphasis in this period was on publicizing (to Russians, in a Russian outlet) the Trump willingness to work together on Syria, and specifically to depart from US efforts to remove Assad.